Zombie Korps is another new first person defense shooter mixed with troops management game on gamesnitro. This is not the first one on its genre but is probably one of the best by far when it comes to zombie defense game. 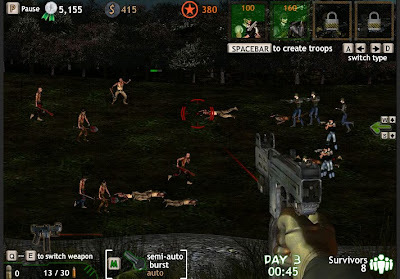 The game offers nicely done graphics and animation complemented with good sound and visual fx. Train your troops and strategically position them in the battlefield of the undead where weapon wielding zombies are the no 1 enemies. You will start off with a pistol a and militia armed with a handgun but can make upgrades and unlock more powerful type of troops to be at your disposal in between rounds. You just have to make it till the last second of the round. Anyways, if you need some help on this game ZK, you can check out this Zombie Korps walkthrough video, not in English though, but you can learn a thing or two from watching.